With the summer wedding season drawing to a close for another year, we are taking some time this month to reflect on the wonderful luxury and country weddings that we have supplied for over the years. As always, we strive to bring you versatile products that look at home in both traditional and contemporary surroundings. Fresh on the wedding scene, and earning their stripes as upcoming favourites, were the stunning Dove Grey Chantilly wedding chair and the stylish Luna Modular Sofa Seating. Unique furniture pieces like this will make your wedding reception stand out from the rest! 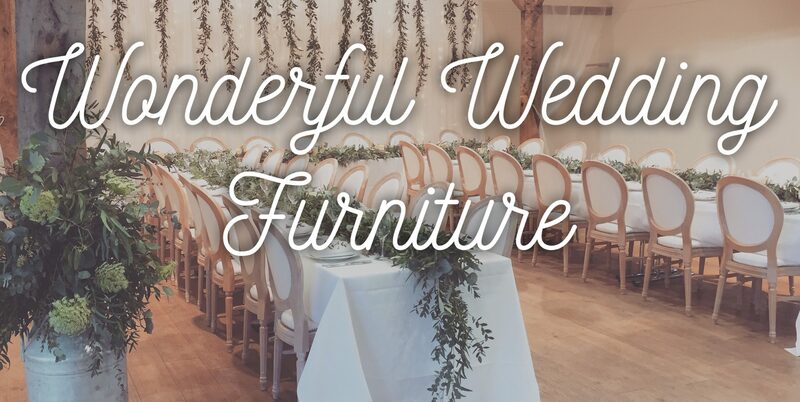 From the very beginning, we have been suppliers of traditional furniture hire to country weddings in marquees, barns and manor house hotels across the South of England and beyond. This has given us a wealth of experience in rural locations, working closely with marquee companies, caterers and wedding planners to achieve stunning wedding receptions with the English Countryside as a spectacular backdrop. Think glamour and elegance and you’ve nailed it! Popular furniture pieces for these wedding receptions are often chosen in response to the following colour palettes: gold & blush pink tones, silver & diamond whites or soft peaches & ivory to name just a few. The beauty of our furniture lies in its versatility. We pride ourselves on being able to coordinate timeless classics with pops of contemporary pieces. We now own one of the largest and most extensive ranges of contemporary LED, mirrored and acrylic products in the UK – ideal for these colour schemes! We can’t wait to see what will be created at next year’s weddings! If you’re planning a wedding, get in touch to discuss the look that we could help you to achieve.